So what does it offer? 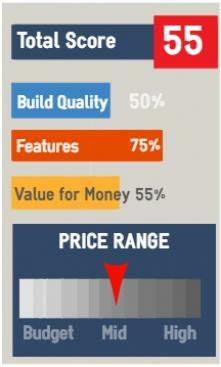 What makes this a better model than other models in the mid-price range? If buying fitness equipment for the home, there are two things to consider. Will it fit? And is it noisy? 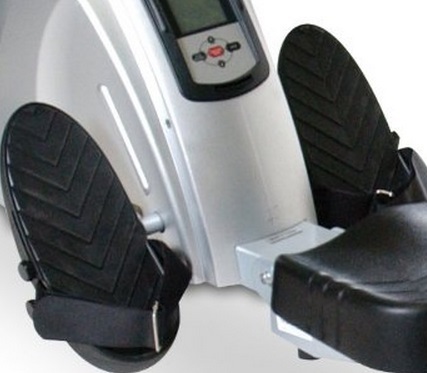 The Velocity rower scores well on both. It would fit in most rooms (see dimensions below) and folds up nice and neat for move-ability and easy storage. And the noise levels? The resistance mechanism is magnetic that makes this a quiet machine to use - very quiet and possibly one of the quieter machines we've tested in this price range. This is a big plus is you live in an apartment or like to watch TV or listen to the radio when training. The seat is not the most comfortable one we've tried, but it's fine for even long sessions on the machine. 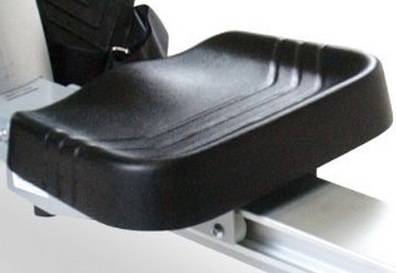 The track (the part the seat slides along) is smooth, and also quiet, so you glide freely even at high stroke rates. However, if you're 6' 2" or taller you may find it just a little too short and would be better spending more on a Concept2. Where the Velocity scores over it's direct competitors is the number of programs. 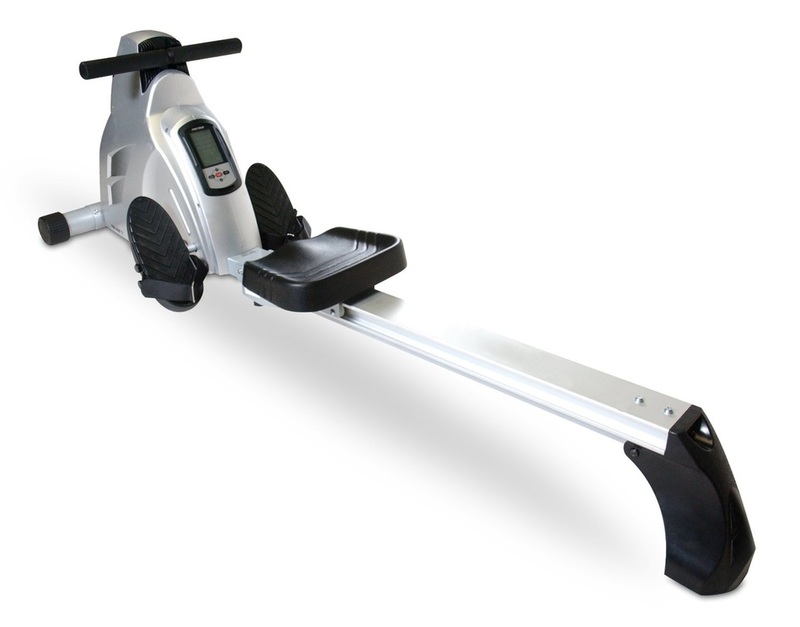 These automatically set your training session by changing the resistance level for interval, time trial or high intensity workouts (see our guide to rowing workouts here). At a touch of a button you can set yourself a goal and let the machine do the rest - all you have to do it keep up! Preset programs add variation to your workouts and help deliver the full benefit of using a rowing machine. Another great bonus in our view, is that it comes with a heart rate monitor (it's a chest-strap which is more accurate than a wrist strap) which is great for heart rate training programs. You set a target heart rate and the resistance adjusts automatically to keep you in that zone. This is great for fat-burning and ensuring a challenging workout. The one big beef we have with this model, is the short warranty - you may get 5 years for the frame (many have lifetime), but it's only 3 months on the display unit and as low as just 30 days on the rest! This is poor for a mid-range model, although many of the users we asked in our survey have had their machine for over a year and experienced few problems. The large LCD display is easy to read during a session. It displays all the usual information such as duration of workout, strokes per minute, distance covered, calories burnt, your pulse and watts (the power you're generating). Our view is the more data displayed the better as this helps to keep you motivated when you can see the improvements. The console has 6 preset programs and 6 slots for manual so you can set your own goals for a session. 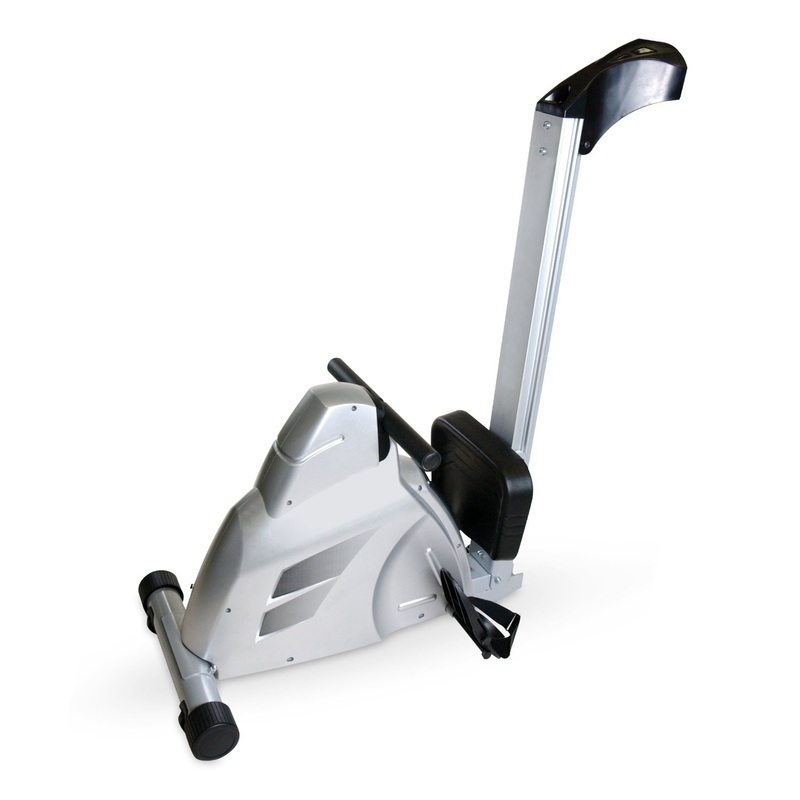 The Velocity Fitness rower is a great package for the home fitness machine user. It's quiet, smooth and has the added benefit of pre-set programs and a heart rate monitor for specifically targeted training. We have no hesitation recommending a machine that will deliver results for a reasonable price - just as long as you use it! Seat is okay, but not the most comfortable we've sat on. Track a little short if you're over 6'' 2"
82" x 22" x 26"
The Bladez Cascade has more feature for around the same price. 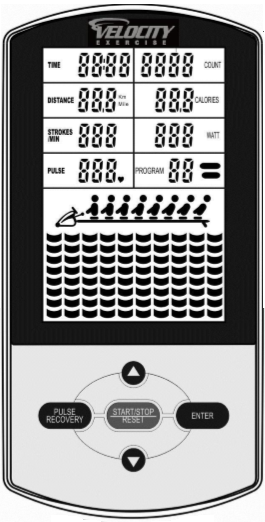 Or for around a $100 more and something a little different, you could take a look at two water rowers - the ProRower or the First Degree Neptune. Check out all our reviews here to compare.